Q & A Collections: Student Motivation & Social Emotional Learning is the headline of one of my Education Week Teacher columns.It brings together links to all the columns on Student Motivation & Social Emotional Learning from the past six years! You might want to visit the publishers website for my book, Helping Students Motivate Themselves. If you click on “sample chapters,” you’ll be able to get several lesson plans and hand-outs for free related to SEL. Social Skills Training Report Is Even More Interesting Than I Thought… is a post on recent SEL research. A Very, Very Beginning List Of The Best Resources On Bullying — Please Suggest More. Maurice Elias writes a great blog for Edutopia on SEL. The Collaborative For Academic, Social and Emotional Learning has many resources. Edutopia has a Social and Emotional Learning page. Education Week also has a number of SEL resources. Social and Emotional Learning Research Review is from Edutopia. ‘How Children Succeed’ — Q&A with Paul Tough is from The Washington Post. Paul Tough on how children succeed. Hint: It’s not academics is from Maclean’s. The grit factor: hard to measure, hard to succeed without is from Ed Source. Teaching the Whole Child: Instructional Practices That Support Social-Emotional Learning in Three Teacher Evaluation Frameworks is a report from the American Institutes For Research. Social-Emotional Programs Target Students’ Long-Term Behavior is from Education Week. I’ve posted another three-part series in Ed Week about teaching character. Socialization technique helps in academic achievement, trial study finds is from The Washington Post, and describes results from a study on using Social Emotional Learning in the classroom. Here’s more info on the same research. The unfortunate outcome of the focus on the research of these individuals is that policymakers and practitioners are being given further reason to view achievement gaps as the cognitive problems of individuals rather than the result of failures in the structures of our schools and societal policies. Teach The Teachers Well is from The New York Times. Integrating Social-Emotional Learning Into High School is from Ed Week. Sacramento city schools focus on emotional learning is a Sacramento Bee story about our district’s SEL program, directed by the extraordinary Mai Xi Lee. Q&A with Daniel Goleman: How the Research Supports Social-Emotional Learning is from Edutopia. Maurice J. Elias has written a very useful article titled Social-emotional skills can boost Common Core implementation for Phi Delta Kappan. Unfortunately, if you’re not a subscriber, it costs $5, which I thought was worth paying. New Federal Grant Aims to Help Schools Boost Noncognitive Skills is from Ed Week. Urban Districts Embrace Social-Emotional Learning is also from Ed Week. Social and emotional learning gaining new focus under Common Core is a very useful and interesting article published by Ed Source. 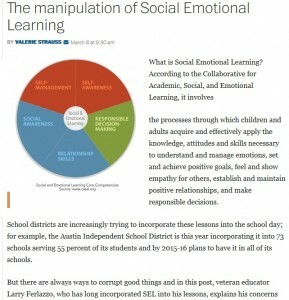 How Are Social-Emotional Learning and the Common Core Connected? is by Maurice Elias. Social-emotional skills can boost Common Core implementation is also by Maurice Elias. How to Integrate Social-Emotional Learning into Common Core is from The Greater Good Science Center. Integrating Social Emotional Curricula and the Common Core is from Inside the Classroom, Outside The Box. Webinar: Social-Emotional Learning Integrated with Academic Literacy Equals Secondary Students’ Common Core Success is from WestEd. Webinar Recording: Where Does Resiliency Fit in the Common Core? is from ScholarCentric. Resiliency Key to Students’ Success in Common Core is from the same group. Survey Suggests Social and Emotional Learning Has Staked a Claim in Schools is from Ed Week. Does This Big New Study On The Importance Of Social Skills Become A New “Marshmallow Test”? Statistic Of The Day: What Character Strengths Predict Well-Being? To Measure What Tests Can’t, Some Schools Turn To Surveys is from NPR. I’m skeptical. Learning soft skills in childhood can prevent harder problems later is from a California public radio station. Tap Ed Tech to Improve Social-Emotional Learning, Report Urges is from Ed Week. When Social and Emotional Learning Is Key to College Success is from The Atlantic. Mai Xi Lee has done a tremendous job working with schools in our district to implement Social Emotional Learning. Why Don’t Students Take Social-Emotional Learning Home? is from Greater Good. Research Says / The X Factor in College Success is from ASCD Educational Leadership. Is There ‘Summer Melt’ for Social-Emotional Learning, Too? is from Ed Week. Scholars: Better Gauges Needed for ‘Mindset,’ ‘Grit’ is from Ed Week. Students Help Design Measures of Social-Emotional Skills is from Ed Week. Is “Emotional Granularity” The Next SEL Skill To Teach? Inner Drive has some fabulous SEL-related infographics. You can see them all here. 16 simple social skills that will make you more likable is a great piece from Business Insider. I think it would be a good one to share with students. How Poverty Affects The Brain is from Newsweek. How to Bring SEL to Students with Disabilities is from Greater Good. Commission Formed to Advance Schools’ Focus on Social, Emotional Development is from Ed Week. Commission Formed to Advance Schools’ Focus on Social, Emotional Development is from Ed Week. Ed Source has an article on the same topic. Should SEL Skills Start Including An Explicit Focus On “Conscientiousness”? Emotion, Sociality, and the Brain’s Default Mode Network meanders a bit, but provides many research insights into Social Emotional Learning. Creating Healthy Schools: Ten Key Ideas for the SEL and School Climate Community is from The American Institutes For Research. Nonprofit Receives $1M Grant to Help Support Social, Emotional Learning is from Ed Week. When Districts Support and Integrate Social and Emotional Learning (SEL) is a report from The American Institutes For Research. How are districts measuring progress on SEL? is from Education Dive. Why Social and Emotional Skills Are Vital to Keep At-Risk Students on Track is from MindShift. On the Interpretation of Non-Cognitive Skills: What Is Being Measured and Why It Matters is a useful research paper. Thanks to Paul Bruno for the tip. Grading Soft Skills: The Brookings Soft Skills Report Card is from Education Next. It raises some interesting points, though I don’t agree with all of them. The Year of Conquering Negative Thinking is from The New York Times. Seven Facts on Noncognitive Skills from Education to the Labor Market looks very interesting. It’s from The Hamilton Project. The Social Emotional Learning Effect is from The Atlantic. What Does It Take to Climb Up the Ladder? is from The New York Times. Do Messages About Social-Emotional Learning Harm Students of Color? is from Education Week. AERA: Measuring Persistence and Self-Control Through Tasks, Not Tests is from Education Week. The Collaborative for Academic, Social, and Emotional Learning, or CASEL, just launched a monster compilation of SEL resources. You can also read more about it at Ed Week. The Wallace Foundation has come out with a big report on SEL programs in elementary schools. You can also read an article about it at Ed Source. Reviewing Social and Emotional Learning for ESSA: MOOSES, not Parrots is by Robert Slavin. The National Association Of State Boards of Education has released a policy update on Social Emotional Learning. No, No, No! Do Not Grade SEL Skills! Education Week has published a special report on Social Emotional Learning. Take particular note of the article Is Social-Emotional Learning Really Going to Work for Students of Color?’ by Dena Simmons. HOW CAN TEACHERS DEVELOP THEIR OWN SOCIAL-EMOTIONAL SKILLS? is from Ed Week. Understanding social and emotional learning: a quick guide is from Ed Source. I’m skeptical, but CASEL has created a new website about measuring SEL skills. Building a Modern Marshmallow Test: New Ways to Measure Social-Emotional Learning is from Ed Week. Social and Emotional Learning for English Learners is from New America. A new study finds that students who experienced Social Emotional skills training were more likely to vote than others. Read about it in Researchers Accidentally Found One Way to Help Kids Grow Up to Be Voters. Comparing students who participated in SEL programs to those who didn’t, the results showed significant benefits that persisted from one to nearly four years afterward. Quiz Yourself: How Much Do You Know About Social-Emotional Learning is from Ed Week. No State Will Measure Social-Emotional Learning Under ESSA. Will That Slow Its Momentum? is from Ed Week. The Power of Being Seen is from Edutopia. Social and Emotional Learning and Traditionally Underserved Populations is a report from The American Youth Policy Forum. Should noncognitive measures be used for teacher accountability? is from Brookings. Principals Like Social-Emotional Learning. Here’s Why Schools Struggle With It is from Ed Week. Learning How to Measure Social and Emotional Learning is from Future Ed. I have issues with lots of ideas on how to measure SEL. There’s More to Life than Test Scores: Measuring Social and Emotional Skills to Support Student Success has some decent ideas, though I’d be very selective. Social and Emotional Learning Interventions Under the Every Student Succeeds Act is from Rand. Ed Week has begun a new blog titled Learning Is Social and Emotional. Enacting Social-Emotional Learning: Practices and Supports Employed in CORE Districts and Schools is from PACE. Social and Emotional Learning for All: Access, Cultural Proficiency, and Cultural Responsiveness is from The Massachusetts Department of Education. Emerging Insights from States’ Efforts to Strengthen Social and Emotional Learning is from CASEL. Applying an Equity Lens to Social, Emotional, and Academic Development is from Pennsylvania State University. ‘Find Your Passion’ Is Awful Advice is from the Atlantic. Stanford research shows that students do better on tests when teachers face down their math demons is from Quartz. Want To Become Extremely Successful? Do These 13 Things Every Day. is an article that might be interesting to have students read…. HERE ARE SOME RESOURCES I’M THINKING OF USING IN A LESSON ON EMOTIONAL INTELLIGENCE – SHARE YOUR IDEAS! Lessons from the first round of the Mindsets & the Learning Environment Initiative is from The Mindset Scholars Network. Schools Should Teach (and Measure) ‘Soft Skills,’ Parents and Educators Agree is from Ed Week. New Report from Gallup and NWEA: Assessing Soft Skills is from NWEA. Research Matters / SEL: Getting the “Other Stuff” Right is by Bryan Goodwin. Survey: Students Say Schools Don’t Give Them Skills They Need to Succeed After Graduation is an Ed Week article about a new report on Social Emotional Learning. Resources to Support Social-Emotional Learning is from Ed Week. Empathy and Resilience, Responsibility and Self-Care: Resources for Social and Emotional Learning From The New York Times is from The NY Times Learning Network. Set Social-Emotional Learning Benchmarks to Guide Efforts, Commission Recommends is from Ed Week. Social and Emotional Learning: From Theory to Practice is from the Education Writers Association. Integrating Social, Emotional, and Academic Development (SEAD): An Action Guide for School Leadership Teams is from The University of Chicago. Why We Can’t Afford Whitewashed Social-Emotional Learning is by Dena Simmons.